Tricia Montgomery was the Public Education Director for the Chicago Veterinary Medical Association from 1993 to 1998, the Executive Director in July of 1998, and served a dual role of both Public Ed Director and Executive Director until 2006. Montgomery was on the Public Education Committee and worked on many programs, including Hurricane Katrina, Mardi Growl, and The Bark Heard Around the World. She also handled the Public Relations for the International Kennel Club Show from 1998 – 2009. Montgomery was an honorary board member of the AKC and has worked with the Canine Health Foundation, HSUS, PAWS Chicago, Best Friends, AAHA and the AVMA. She is now President of the K9 Fit Club where she combines fitness with the friendship of man’s best friend. K9 Fit Club offers a wide variety of workout options, making fitness fun. K9 Fit Club offers group and individual instruction, both indoors and outdoors, using proprietary programs including; Oh My Dog Bootcamp™, “Bow Wow Bootcamp™, Puilates™, Tai Chi Wa Wa™ and Fungility™. K9 Fit Club’s headquarters and training facility are located in Hinsdale, IL where there are Veterinarians, Doctors, Certified Animal Behaviorists, People and Pup Personal Trainers on staff, passionate about developing human/animal bonding programs. Their efforts have been coordinated with Dr. Ernie Ward, Founder of the Association of Pet Obesity Prevention. K9 Fit Club has also collaborated with schools to develop an after school fitness program. The dogs are able to help the children open up and potentially give an opening for therapy. The Club even offers a Leash & Loan program, which allows people without a dog the chance to participate, exercise with dogs, and possibly adopt one. 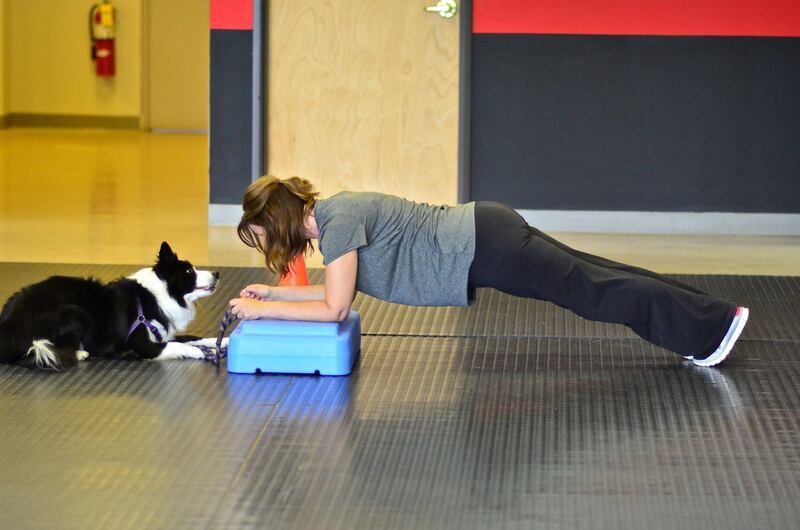 K9 Fit Club’s programs are customized to individual fitness and goals of both dog and owner. Each dog and person undergoes an assessment and evaluation that includes cardiovascular endurance, muscular endurance, obedience & nutritional assessment, behavior and activity analysis and more. By undergoing an assessment, the staff will be able to design a class to better fit the needs of the person and the animal. The Club has specialty programs which serve clients who have Down’s Syndrome, hearing impairments, spina bifida, as well as Breast Cancer Survivors. 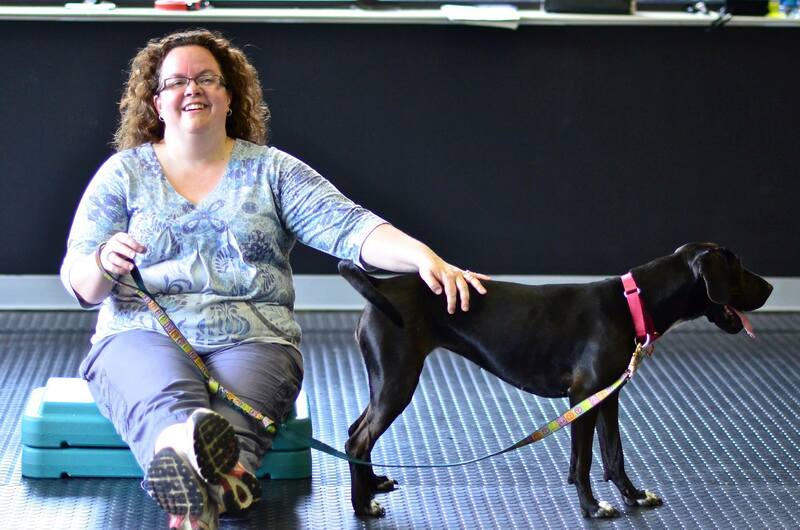 K9 Fit Club even designed a class specifically for a young man with spina bifida. That class, Sit and Be Fit, focuses on working on upper body strength while sitting in a wheel chair. Rebekkah Rakow & Mazie– Becky came to K9 Fit Club weighing 417 lbs., she could not walk her dog, Mazie, to the mailbox without stopping to catch her breath. Becky now weighs 320lbs and her dog passed away of kidney failure two weeks ago. K9 Fit Club has become Becky’s extended family. She has not stopped attending classes and is using one of the dogs from the Loan & Leash program. Becky also wanted to give back to the program, as she does not pay for classes due to income level. She helped create and develop our program for the deaf, as her best friend is hearing impaired. 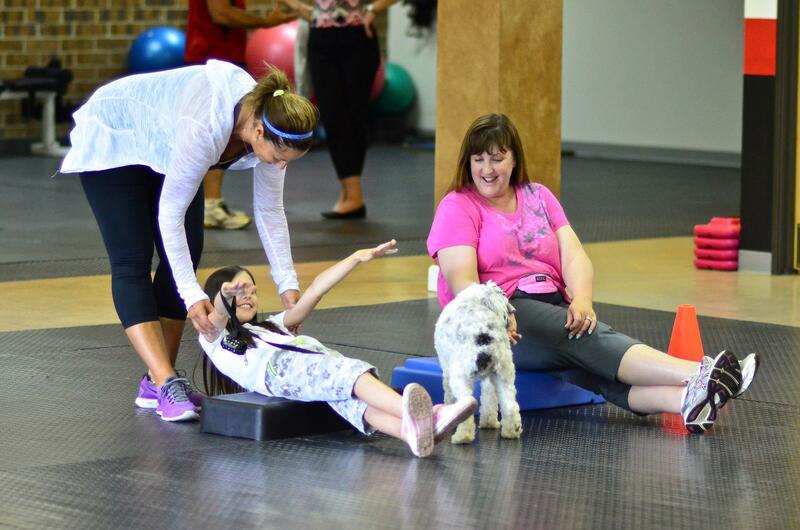 Cindy Rodkin & Khaki – Cindy & Khaki, her Golden Retriever, came to K9 Fit Club last August. Cindy had gone through a very tough divorce and had gained over 100 pounds. Khaki’s behavior had gone from bad to worse. Since October, Cindy has lost 85 pounds, gained much needed confidence, and the “mis” behaviors in Khaki are gone. If you would like to learn more about K9 Fit Club and Tricia Montgomery feel free to visit their website http://k9fitclub.com/ or atTricia@k9fitclub.com.